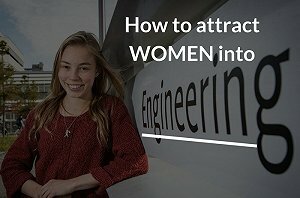 How to attract women into engineering? In celebration of the International Women’s Day, Anglo Technical has decided to make a quick overview of the position of women in the workplace and in engineering, in the UK and worldwide. Over the past few decades, women have proven they are able to engage in lots of activities that were once only reserved for men. We are still far from reaching a global gender equality in the workplace, but there have been some significant achievements nonetheless. In the US for instance, in 2012 women were creating businesses at x1.5% the national average, and in the UK the number of women in apprenticeships has risen from 138,000 in 2009 to 330,000 in 2010. Is the world becoming a fairer place for women? Some argue that little has changed although figures and statements are showing that we are definitely moving in the right direction. An appalling 40% of large public companies worldwide have no women on their board of directors however the Governance Metrics International (GMI) has also identified that the top 10 S&P 500 companies have about 22% women on their boards. When looking at the percentage of companies with Women Board members by country, we will notice the UK (12.5%) and many European countries are lagging behind countries like South Africa (15.8%) and the US (16.1%) and are far from the encouraging figures that Nordic countries have attained such as 40.1% in Norway and 27.3% in Sweden. Arianna Huffington, Founder of the Huffington Post once said: “women still have an uneasy relationship with power and the traits necessary to be a leader. There is this internalised fear that if we are really powerful, we are going to be considered ruthless, pushy or strident- all those epithets that strike right at our femininity. We are still working at trying to overcome the fear that power and womanliness are mutually exclusive”. A study of The Institute of Electrical and Electronics Engineers (IEEE) database found that “in the Asia-Pacific region and Europe, the percentage of females pursuing engineering careers looks to be greater than any region within the US”. Asia-Pacific region is leading the way with 43%, around 5% on average for each region of the USA and 23% for the region including Europe, Africa and the Middle East. According to a recent Engineering UK report, between 2012 and 2022, of the 2.56 million job openings that will emerge in engineering companies, nearly a third (32%) are forecasted to be filled by women. This said, the report also witnessed that nearly three quarters (71%) of male engineering graduates who were in employment went into an engineering occupation compared with just over half (58.7%) of female graduates in the past few years. In the UK, in 2015, there were 32,026 applications to higher education in engineering, a one-year increase of 5.5% (almost double the 3.1% increase for all subjects). But, overall only 12.9% of these applications to engineering degree were female applicants. Some 80% of UK businesses believe careers advice for young people “is not good enough to help them make informed decisions about future career options”. Of a cohort of 1,000 11-year-olds, 111 boys and 101 girls will achieve a Physics GCSE A-C, 44 boys and 13 girls will achieve a Physics A-Level and 21 males and only 3 females will obtain an Engineering and/or Technology degree. According to Engineering UK report, “the UK at all levels of education does not have the current capacity or the required rate of growth needed to meet the forecast demand for skilled engineers and technicians by 2022”. The engineering community must recognise that, despite numerous campaigning initiatives over the past 30 years, there has been no significant advance in the gender participation of women into engineering. There are several ideas about what could be done in order to retain more women in the engineering fields. The role of women could be reinforced in order for the profession to attract more female candidates by ensuring some measures keep on being tackled by governments such as: flexible working hours, satisfactory earning potentials for women, equal opportunities for training and career advancement and incentives for efficient collaboration among co-workers. Most importantly, there seems to be a need to change people’s mind-set and misconceptions regarding the engineering sector. Parental perceptions of engineering will inevitably affect our future generation of engineers. At present, 12% of parent’s state that they would like their son to become an engineer while only 2% said the same about their daughter. Doubling the number of engineering and technology graduates to meet the demand for future engineering graduates and to meet the additional shortfall in physics and engineering teachers. Doubling of the number of young people studying GCSE Physics as part of Triple Sciences or equivalent and a growth in the number of students studying Physics A-Level with a particular focus on increasing the take-up and progression by girls. A large increase in Apprenticeship places in engineering and manufacturing technology, construction planning and the built environment, and information and communications technologies – with particular emphasis on 18- to 24-year-olds. High quality, engineering engagement interventions and careers inspiration for all 11- to 14-year-olds. This inspiration must highlight the value placed on STEM skills, promote the diversity of engineering careers available and provide real life engineering context. Support for teachers and carers delivering careers advice so that they understand modern scientific, technological and engineering career paths, as well as vocational roles. Special thanks to the Women's Engineering Society for their great work in the domain. Click to browse all our live engineering jobs.